The Reverend doesn’t ask readers to donate to crowdfunding projects all that often, but I’m going to break with tradition and recommend…nay, demand that y’all offer up some coin for Sidemen: The Long Road To Glory. 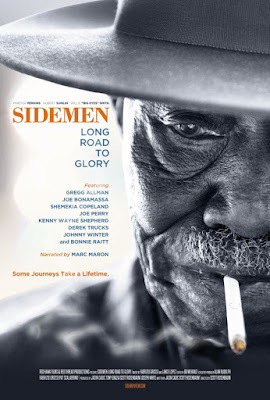 An award-winning documentary film about the lives, music, and legacies of blues guitarist Hubert Sumlin, pianist Pinetop Perkins, and drummer Willie “Big Eyes” Smith, Sidemen: The Long Road To Glory premiered at the 2016 SxSW Film Festival and had an extremely successful festival run. Now the producers are looking to take the film worldwide and although they have cleared the music and video footage rights for festival showings, they need to raise some cash to clear the rights for wider release of the film, and that’s where y’all come in. Directed by filmmaker Scott Rosenbaum and narrated by Marc Maron, Sidemen: The Long Road To Glory presents these three bluesmen as the important musicians they were, the three lending their talents to legends like Muddy Waters and Howlin’ Wolf. The film includes testimonials from such musical heavyweights as Keith Richards, Bonnie Raitt, Gregg Allman, Derek Trucks, Warren Haynes, and many others. Filmed during the final years of the artists’ lives, Sidemen captures the late career triumph of Perkins and Smith upon winning a Grammy™ Award for their 2010 album Joined At The Hip. The Kickstarter campaign for Sidemen is trying to raise $225,000 for wider distribution of the film. They have plenty of cool rewards for donors, such as digital downloads of the film, a copy of the cool movie poster seen to the right, a DVD of the film, buttons, t-shirts, and other memorabilia as well as a one-year subscription to Blues Music magazine. Check out the Sidemen Kickstarter page to find out more about this worthy project.